Tsum Valley and Manaslu Trek | Cost | Itinerary | Review | Base Camp Adv. 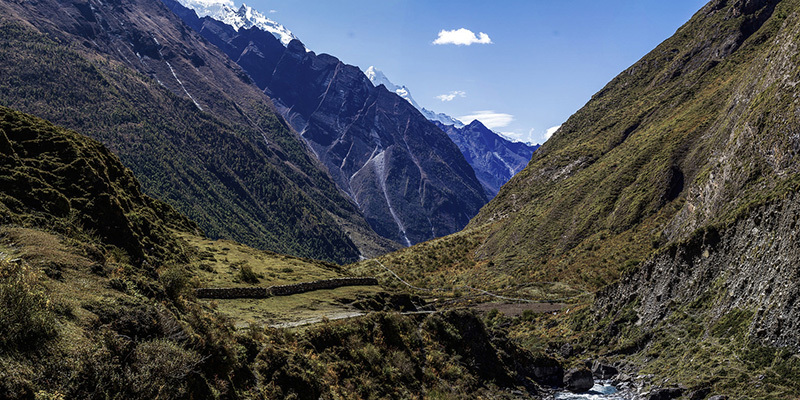 An extraordinary journey to the isolated valley in the Manaslu region, Tsum Valley Trek is an ideal trek for curious travelers who seek peace in the off-beaten. Trekking in Tsum Valley was restricted until 2008 hence the nature and culture of the valley have remained divine and pristine. This trek allows you to explore the pure virtue of Tibetan Buddhism whilst being in the lap of the Manaslu Himal Range. You will begin your trek after the seven hours drive from Kathmandu to Arughat. The first half of the trek ascends to the Budhi Gandaki Valley crossing terraced fields, dense forests, hills, and villages. 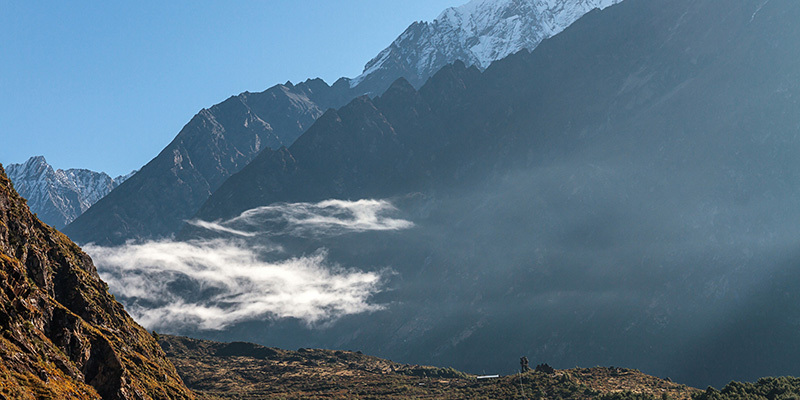 After leaving the main Manaslu trail, you will move towards Tsum Valley crossing glacial rivers and alpine forests. You will visit historic Gompas of this region like Mu Gompa, DhephuDoma Gompa, and Rachen Gompa. The locals of this region belong to Tibetan origin, speak a unique dialect, and also have their own rich ancient culture, religion, and art. The trail is filled with various artistic Chortens and Mani walls made of thousands of stone slabs carved with deities and prayers. Traditionally Tsum valley was a culturally distinct geographical area called ‘Tsum Tso Chuksum’, which means thirteen provinces ruled as a single territory. The ancient remains of the Tsum Kingdom are still visible today. Due to its remoteness and inaccessibility, this sacred valley and its people have been bypassed by mainstream development for centuries. As a result, the unique culture of this valley has remained intact. Only few trekkers have made it to this mysterious valley which also used to be the important trade route between Nepal and Tibet. Tsum Valley has an ancient history of Buddhism, and it is believed that Buddhist saint Milarepa used to meditate in the caves of this region. After exploring Tsum Valley, the trek takes you to the main Manaslu Circuit Trail and traverses across the dramatic Larkya La (5160m) pass on the way back. Day 01 : Arrive at Tribhuwan International Airport (TIA), Kathmandu and transfer to hotel. After your arrival in Kathmandu, we will welcome you at the airport and then transfer you to the hotel. Overnight at a hotel in Kathmandu. Day 02: Sightseeing in Kathmandu Valley and trek preparation. Today you will explore Kathmandu. Kathmandu valley is home to seven UNESCO listed world heritage sites, including Pashupatinath, Boudhanath, Swayambhunath, and Kathmandu Durbar Square that you will be visiting today. After getting a taste of Kathmandu, you will meet with the rest of your team and the trek will be discussed briefly. Your guide will help you make the necessary preparations for the trek. Overnight at the hotel in Kathmandu. Early morning drive from Kathmandu to Soti Khola will mark the commencement of the trip. The roads are dirty and difficult to walk on but the landscapes of the rice fields, waterfalls, and greenery through the villages is amazing to watch. Arkhet bazaar is an interesting old market and the Arkhet Khola is the main attraction to see. You can see at least one lodge and beautiful local houses with slate roofs as you walk to the north. There are also shared jeeps to go from Arughat to Soti Khola. Soti Khola is a small village where the picturesque landscape and greenery will leave you in awe. Overnight in Soti Khola. The bumpy and rocky trail leads you to the rough part of Budhi Gandaki basin. You will cross several waterfalls as well. As you walk, you will come across Liding where there are a camping site and Lapubesi which is a village attached to a lush hill. The view is mesmerizing and peaceful. Later, you walk on up and down trails along the slippery rocks. The tropical vegetation adds beauty as you cross thrilling suspension bridges to reach Machha Khola. The village is on the slopes of the hills where you can find different accommodation and medical clinic if needed. Overnight in Machha Khola. You walk to Tatopani on the narrow trails between Budhi Gandaki and a cliff. After an hour walk, you reach Dobhan and then Shyaule Bhatti and finally Yaru, where the scenes of Budhi Gandaki will leave you in awe as it descends rapidly in nice cascades. After 2-3 hours, you will reach Jagat to find slate-paved streets. There is a campsite in the lower part of the village as well as lodges with basic accommodations. The local people here make their living via tourism, agriculture, education, and government services. Overnight in Jagat. Today’s route goes through rugged rocky terrain alongside Budhi Gandaki River. You will come upon many up and down en route. 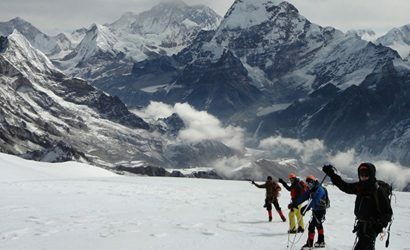 Despite the ruggedness, the route provides you with good views of Shringi Himal (7161m). Finally, you will reach a large Gurung village with fields of corn and millet, which is Philim. Overnight in Philim. Continuing to ascend alongside Budhi Gandaki River, you will pass a beautiful waterfall before reaching Lokpa. 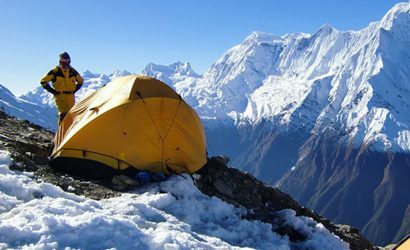 You will then cross many small streams and climb alongside Siyar Khola enjoying the views of Ganesh Himal range until reaching Chumling. 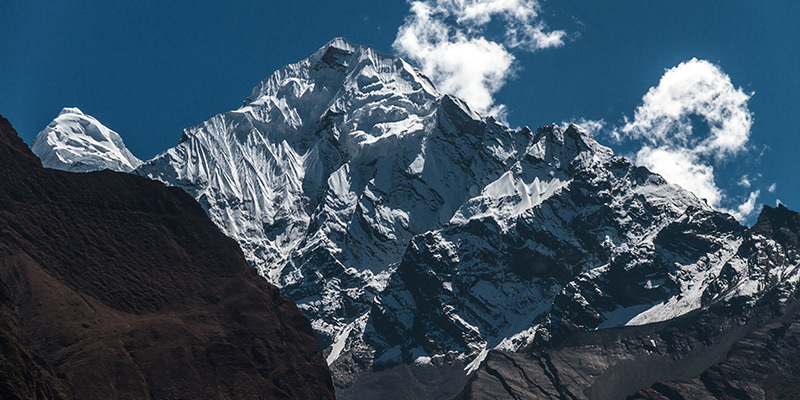 Shringi Himal (7161m) appears to look closer as you reach Chumling. Overnight in Chumling. 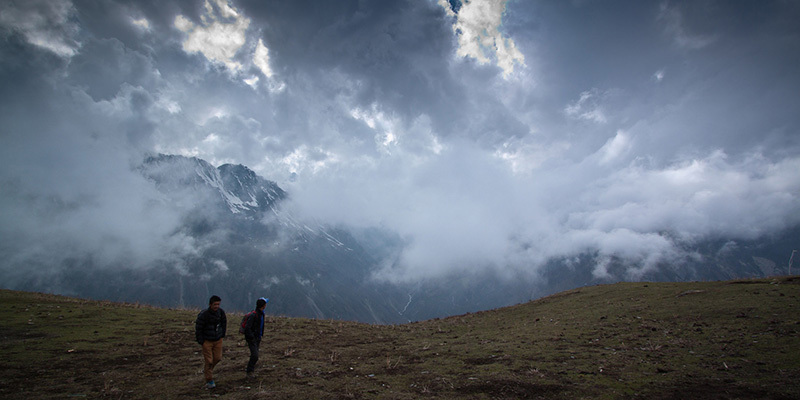 Today you will trek alongside Siyar Khola all the way to Chhokang Paro, which is a Tibetan-Buddhist settlement. The route passes through various ancient monasteries like Tanju, Rainjam, and Gho until you reach the Dzong in Chhokang Paro. 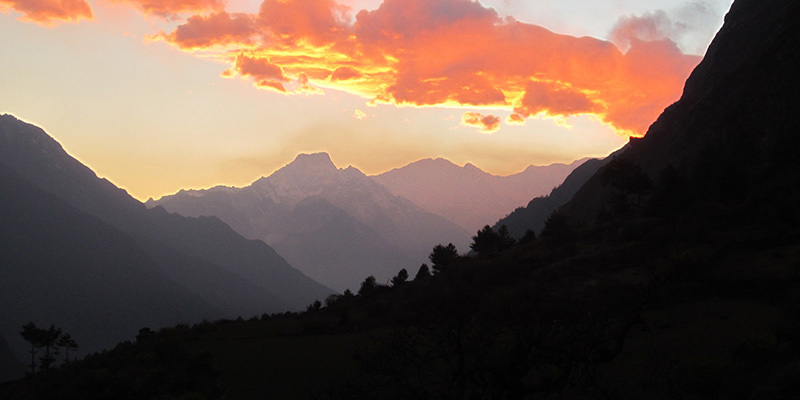 From the village, spectacular views of the Ganesh Himal range and the Tibetan Himalayan range can be seen. Overnight in Chhokang Paro. From Chhokang Paro, you will trek to the Nile via the Milarepa Cave, a sacred meditation cave used by the revered Yogi Milarepa. You also visit the Chi Phu Gompa before ascending alongside Siyar Khola to reach the Nile. In the evening, you can cross the river and walk for a while to visit Gonhgye Gompa. Overnight in the Nile. These Tibetan styled settlements signal you of getting closer to Tibetan border. You will climb past Mani walls and reach up to the Mu Gompa, where you can see many young monks learning Buddhism at the DhephuDoma Nunnery Gompa. Then you will further climb up to the quaint village of Bhajyo. Overnight in Bhajyo. 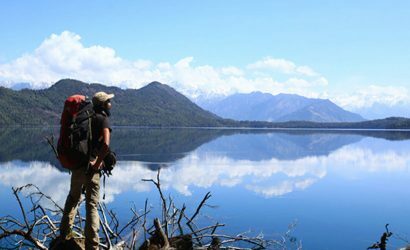 You will take a day off trekking in Bhajyo. You can spend the day exploring Bhajyo and the neighboring villages. You can hike alongside Yangdol Khola and reach the Nepal-Tibet border or follow Changman Khola to reach Thapla Bhanjyang (5104m), another entry point to Tibet. 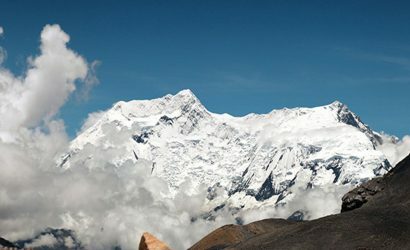 Enjoy an unobstructed view of Shringi Himal (7161m). Overnight in Bhajyo. From Bhajyo, you will descend to Rachen Gompa, passing a beautiful waterfall. Rachen Gompa is one of the oldest monasteries that hold a great religious importance among the locals of Tsum Valley. The nunnery of Rachen Gompa is vibrant with young student nuns dressed in their maroon attire. Overnight in Rachen Gompa. Today you will cross a bridge which leads back to Chhokang Paro. You will descend gradually alongside Siyar Khola until reaching a small Gompa in Gho. Then a steep descend along the river takes you to the village of Domje. Enjoy a close-up view of the Ganesh Himal range. Overnight in Domje. From Domje, you will continue to descend towards lower Tsum valley. You will pass the village of Ripchet and descend gradually to reach Lokpa. You will then cross a suspension bridge over Budhi Gandaki River to enter the Manaslu Circuit Trail and follow the river upstream to reach Bihi via Nyak, Deng, and Rana. Overnight in Bihi. Through most of the trek today, you will be passing through a plain terrain. Then after the plain trail, the trail moves uphill through the forest with mixed vegetation. Passing a waterfall and a few monasteries in Ghap, you make your final ascend to reach Namrung. In Namrung, you can visit the Namla Gumba, which hosts an amazing panorama of Ngadi Chuli (7871m), Himal Chuli (7893m), and Boudha Himal (6672m). Overnight in Namrung. The trail from Namrung to Sama Gaon through a winding path on a ridge above the thinning Budhi Gandaki River. Passing through the villages of Lama and Sho, you reach the home of Ribung Gompa, Lho. Later, it is a steep uphill climb until Shyala, from where the trail is flat and easy. Upon arrival in Sama Gaon, you can visit the sacred PemaChyolingLhakang. Overnight in Sama Gaon. 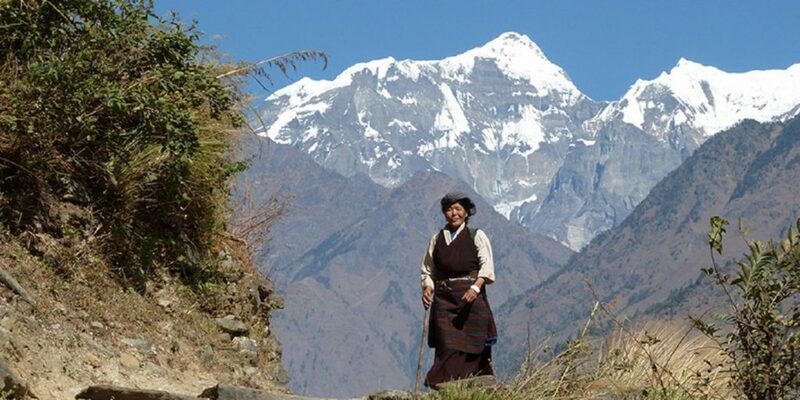 Today’s trek offers you fantastic views of the mountains, especially the Manaslu (8163m). You ascend to reach the frozen lake of Birendra Tal and then climb slowly on a quiet path to reach the village of Samdo. Cross a stunning Mani wall and visit the Taka Choeling Gompa in Samdo. Overnight in Samdo. You will cross a couple of streams which will take you to Larkya Bazaar. The trail is steep and crosses Mani walls to reach the base of the dramatic Larkya La (5160m). A steady climb from Larkya Bazaar takes you to the stone hut of Dharamsala, also known as Larke Phedi. Overnight in Dharamsala. 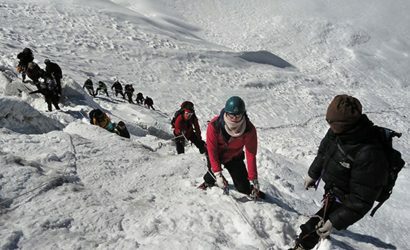 Today you will ascend along the lateral moraine of Larkya Glacier to reach the frozen pass of Larkya La (5160m). 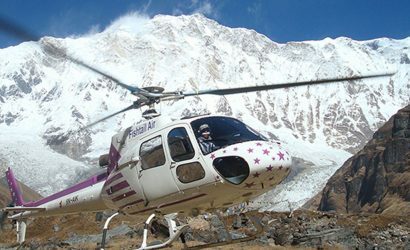 The top of the pass provides you with magnificent views of the Manaslu and Annapurna massifs. You will then climb down the icy path with the views of various glaciers to reach Bimthang. Overnight in Bimthang. Today you will descend through alpine forests which lead you to the village of Gho. Trekking along, you will come across several small settlements, including Tilje. Leaving Tilje behind, you will descend to Dharapani when you cross the suspension bridge over Dudh Khola. Overnight in Dharapani. Today you are taking off-road jeep for another four hour to Beshisahar. You gradually descend for some time to reach Syange village, then the trail ascends to reach Gharmu Phant and then descends to Beshisahar. Today you will drive back to Kathmandu from Besisahar. Enjoying amazing landscapes filled with lush hills and wide river networks. Upon your arrival in Kathmandu, you will be transferred to a 5-star hotel for your overnight stay. Day 22: Transfer to international Airport for next destination. After breakfast, you will be taken to the airport 3 hours prior to the scheduled time of your flight back home. Goodbye and have a safe journey! Airport pick up and dop-off. 03 night's Kathmandu hotel with breakfast. Best available guest houses accommodation during the trek (mainly in twin sharing). A local government licensed English speaking trekking guide during the trek. Porter to carry your luggage during the trek (1 porter for 2 trekkers). Food, accommodation, salary, insurance, equipment, medicine and transportation for all trekking staffs. All necessary trekking permits and entry fees. Down Jacket, sleeping bag and duffel bag. Oxymeter to check your pulse and oxygen saturation and heart rate. Manaslu and Tsum Valley trek route map. Alcoholic, hot and cold drinks, laundry.